The rise of the Granny Flat phenomena is growing Australia wide as we speak! There is a chronic housing shortage across the board and, coupled with housing affordability it seems to be the next logical step to be looking at. Several states across Australia now have joined the Granny Flat Revolution. Western Australia is the latest state to jump on board and now allows the humble Granny Flat to be built as an investment as well as for the immediate family. Homeowners and investors alike have begun to realize the huge potential of this – I’m talking about a positive return on investment (ROI). The maths is really quite simple, particularly if you are in a negative geared situation : this may be the way to turn that situation around. 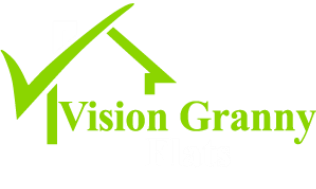 So how can you secure your Granny Flat construction loan? The simplest way to secure funds for your new Granny Flat is either via a ‘Redraw” facility or a ‘Line a Credit’ on your existing housing loan. To put it simply : If you owe $200,000 on a property that is worth $400,000 you have $200,000 in equity. And say a granny flat is going to cost you $130,000, you could finance the building of one through the $200,000 equity you have. If you don’t have any equity or don’t want to use any redraw facility you have the next best thing is a ‘Construction Loan’. This loan product is slightly different from a standard mortgage loan as you use the value of the existing property and the proposed construction build as security against the Granny Flat loan. If you have an existing bank manager or mortgage broker, this is probably your first port of call. For local Queensland councils, this is a relatively new concept for investment purposes. Ipswich City Council was the first local council in Queensland to allow it and we have been instrumental in the building of the first several new builds, and continue to do so as part of the urban infill strategy. For the financing of the Granny Flat builds, each individual owner has had their own personal financial situations, and each one has been financed differently. One of the requirements for your finance is the actual formal approval for the Granny Flat. For Logan City Council, either a Private Certifier or one of the council’s certifiers can provide this for you. My advice to you is to choose a designer / draftsman that is experienced and familiar with the council’s requirements for the local area. This will ensure that between the design and final approval process, it will be as smooth and easy flow as possible, thereby keeping your costs to a minimum. You need to engage the experts in their field i.e. those that deal with this every day – and Logan Granny Flats are the leaders for your Granny Flat builds. The final and probably most important part of the equation is the Building Contract itself, which needs to be completed prior to the loan approval. As with a contract for a house or land, the building contract is a legally binding document that should be prepared by a Licensed Builder. It will either be on a Building Services Authority (BSA), Master Builders Association (MBA) or other commercial Building Contracts such as provided by the HIA. Your certifier will also want evidence of insurance for the project and Long Service Levy if applicable. ‘Home Warranty Insurance’ also needs to be addressed for each project, and you will find your lender won’t release either the progress payments or the finance without this. This is extra protection for you during the whole Granny Flat build process. We would also recommend that you use a lender or broker with the experience and the local knowledge of the whole process, someone who lives and breathes Ipswich – we can point you in the right direct here as well, just ask us! We here at Logan Granny Flats have building experience spanning 35 years, and a hands on, local knowledge and understanding of the specific planning requirements – so why would you look at using anyone else? It’s a no brainer for those looking for a quick effective solution to their families needs or for the astute investor looking to gain a positive return on investment (ROI)! 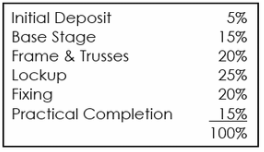 Building Payments, then drawn down ..
As the building progresses, payments for each stage will be requested through to final completion. The lender will have a loan assessor / registered valuer confirm each stage before signing the next progress payment approval. Once construction is complete and the Certifier issues the Form 21 Completion Certificate, final payment will then be made. It’s at this stage that your Construction Loan then coverts to a standard loan product whether it’s setup up as a redraw facility, principle and interest, or interest only loan. We hope the above has been a guide that helps you understand how to secure finance for your Granny Flat ! for your Granny Flat ?